If you need a nice ride in the great Beijing city, just simply contact us now to get our BEST QUOTES and GREATEST SERVICES today! Car rental serivice provider in Beijing China ! We drive your way in Beijing! Beijing, also known as Peking, is one of the largest cities in China, and the capital of the People's Republic of China. Governed as a municipality under direct administration of the central government, it is also one of the Four Great Ancient Capitals of China. Beijing is divided into 14 urban and suburban districts and two rural counties. With dozens of railways, roads and motorways passing through the city, and many international flights connection, it is a major transportation hub. Beijing is recognized as the political, educational, and cultural center of China while Hong Kong and Shanghai predominate in economic fields. The famous 2008 Olympic Games has been held in Beijing. 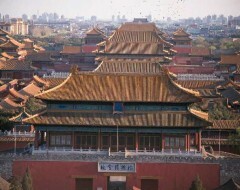 As one of the world’s great ancient capitals, it is home to some of the finest remnants of China's imperial past ,it has many famous historic sites, including: the Forbidden City, the world-renowned Great Wall,the Temple of Heaven, the Summer Palace , the Ming Tombs etc.The biggest industries of Beijing are real estate and auto mobile. The maximum amount of GDP is earned from these two industries. The major industrial area of Beijing is Shijingshan on the west. Agriculture also plays a vital role in the Beijing's economy. Apart from other vegetables, wheat and maize are the main crops grown here. Shanghai Car Rental Service will be very honored to have the opportunity to serve you in Beijing with our great limousine services, we will insure a hassle-free, most comfortable trip no matter you are traveling Beijing for official business visits or personal tourists. All our drivers are from local and they are all licensed, well trained and with more than 6 years’ experience in serving our foreign customers, they are also quite familiar with the routes in Beijing and can easily drive you wherever you want. ◆ Beijing cruise terminal transfer to hotel and airport , other shuttle services. ◆Beijing railway /bus station transfer services include shanghai South,West and Beijing train stations. ◆Beijing Daily Limousine or car rental services (Chinese or English chauffer services) for short term period, such as Beijing Day tour to The Great Wall, Beijing City tour sedan /mini van/mini bus/coach services for individual or group travelers. ◆Long-term car lease for individuals or cooperates in Beijing.